Safia, an Imperial nightblade, is a pirate captain that commands the vessel Red Wave. She is the assassination target in the quest Kill Safia. She is reputed to be a ruthless, proud fighter who leads a loyal and bloodthirsty crew, ready to smuggle anything for the right price. She wears scaled armor with matching boots and bracers. 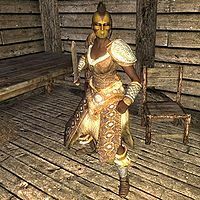 She wields a leveled enchanted one-handed sword (up to Daedric quality), and carries a leveled potion or poison, leveled gold (range 50-250), a leveled gem, a belted tunic, and a selection of common items and gold. If she is alive, crew member Dorian will admit that he is intimidated by her: "I've only been a part of the Red Wave's crew for a few weeks, but I've already learned to stay out of Captain Safia's way." Should you ask Nazir about her, he will tell you, "Ah, yes. The pirate captain. A ruthless she-devil, by all accounts. Deadly with a blade. And let's not forget her crew - loyal and bloodthirsty, the lot of them. This is my final contract, and certainly the most challenging. Be careful with this one, my friend." Talking to him again before killing Safia will also have him say, "You haven't faced that pirate captain yet, have you? Safia? I only ask because you're still alive..." Guests at the Thalmor Embassy party may gossip about the Red Wave: "Apparently, the Red Wave has been docked in Solitude for well over a month, and with no sign of shipping out any time soon. Some say the ship suffered damage to her hull when she struck an iceberg, and Captain Safia can't afford the repairs. Of course, she would never admit such a thing. Captain Safia is far too proud a woman for that." As for the Red Wave pirates, ask local citizen Addvar about good fishing spots and he will describe the Red Wave as "thugs". Meanwhile, Thane Erikur, rumored to be dealing with them, will tell you, "There's pirates and then there's the crew of the Red Wave. They're in a class by themselves. 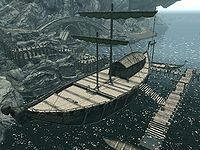 They usually make runs along the coast shipping all sorts of contraband to and from Morrowind. Rumor has it they can get you anything for the right price." This is proven by the fact that the ship's first mate, Sabine Nytte, possesses a sample of Balmora Blue, an extremely valuable and illegal substance. However, the crew is not mere smugglers and thugs, as another crew member Eris will say, "My father was all the family I ever had. I felt so lost when he died. But the crew of the Red Wave's my family now." If Captain Safia sees you, she will make various comments on your trespass: "You'd better have a damned good reason for being here...", "It takes a brave soul to wander onto my deck. It'll take more than that to leave in one piece. ", "I'd say you're either brave or stupid, but I can already tell which one it is. ", or "You must have a death wish." "The Dark Brotherhood? Yeah, yeah, yeah. You think this is the first contract I've had on my life? I'm a pirate, sweetie. Assassination attempts are an occupational hazard. Now, shall we?" "You face the Dread Lord..."
"Sithis? Let me guess: 'In the Void!' By the gods, you Dark Brotherhood are a predictable lot, aren't you? Okay, here's how this works. You try to assassinate me, and I kill you. Horribly. I have done this dance before, you know." "Ah, I see. The old Dark Brotherhood 'silent intimidation' treatment. Oh, I know who you are. Don't be so surprised. You ain't the first assassin sent to kill me. Won't be the last. Now let's get this over with." This page was last modified on 12 January 2016, at 11:30.